Spondylolisthesis is defined as being a condition where the vertebra within your spine slip forward and out of place. This can occur anywhere along the entire length of the spine. In some cases, Spondylolisthesis may not cause any symptoms at all. However, some people may experience leg and back pain which can range from mild to severe. Many different kinds of spondylolisthesis can affect people, however the most common forms of spondylolisthesis are spondylotic and degenerative. The type may impact the form of treatment, whether surgical or non-surgical. As mentioned before, even though there are several different types of spondylolisthesis that affect adults, spondylotic cases one of the most common forms. This occurs when one of the bones in the lower back breaks and causes a vertebra to slip forward. In most cases, the fracture occurs during the adolescence years and typically goes unnoticed until adulthood. As such, spondylotic spondylolisthesis is most commonly seen in middle-age men. As we grow older, typical wear and tear that goes hand-in-hand with aging causes changes in the spine. In some instances, intervertebral disk gradually becomes dryer and weaker. As such, they lose height, eventually become stiff and bulge. This type of degeneration is defined as being the beginning stages of degenerative spondylolisthesis or (DS). Some of the most common symptoms of spondylolisthesis include low back pain. In some instances the pain may even spread across the lower back and feel like a muscle strain. The condition itself also causes various muscle spasms in the hamstrings muscles which can cause an individual to walk with short strides or to walk with their knees slightly bent. When it comes to diagnosing Spondylolisthesis, an X-ray can be conducted on the lower back to determine if the vertebra is out of place. 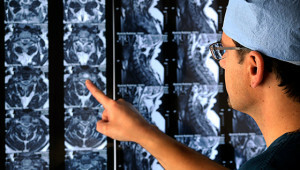 In most cases a medical examiner will use a magnetic resonance imaging (MRI) or computed tomography (CT) to produce detailed images of the spine. These kinds of scans can be utilized by the medical examiner to clearly see the nerves as well as the bones that are associated with the spine. The treatment of spondylolisthesis can involve either surgical or non-surgical intervention. Below we discuss both options for spondylolisthesis treatment. Spondylolisthesis surgery treatment consists of removing built up pressure and spinal fusions. When it comes to removing pressure, it consists of opening the spinal canal. 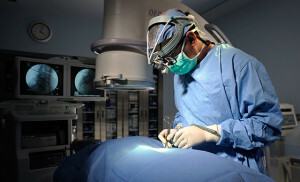 This procedure itself is defined as being a laminextomy. Spinal fusion itself is defined as being a welding process. The general idea is to fuse the displaced vertebrae back together so that they can heal into a single, solid bone. The fusion process itself takes several months before the bone is able to become solid again. It’s worth noting that, while surgical treatment can help to repair the slippage that’s associated with this condition, nonsurgical treatment options do not repair the slippage and can only relieve a patient’s symptom. Medication – Non-steroidal anti-inflammatory medicines and analgesics can help to alleviate pain. Physical Therapy & Exercise – This entails the utilization of specific exercises which can help to stretch and strengthen the abdominal and lower back muscles. Steroid Injections – This entails the utilization of cortisone injections which are applied around the nerves or in the epidural space which can help to alleviate pain as well as to decrease swelling. To learn more about Spondylolisthesis, including conditions, treatment options, and other information, visit the Back Pain Center at WebMD.com.